Your child smiles at you as you pick them up from school, and the first thing you notice is that their teeth are starting to look a little crooked. Is this something you should be concerned about? You don’t want to put them through the trouble of getting their teeth fixed if they don’t really need it. Doesn’t it just affect how they look? Unfortunately, crooked teeth can cause a whole host of health problems for your child, and your dentist in Westport is going to discuss 7 of them today. The teeth have many hard to reach surfaces even when they are perfectly straight. Crooked teeth trap more food and can be much harder to clean, and this can make your child more vulnerable to tooth decay and gum disease. If your child’s teeth are misaligned, this can often make their jaws not come together properly, causing their teeth to rub together. Eventually, this can wear them down and cause them to crack and break. Teeth that are protruding are more likely to suffer damage in the event of an injury, and this is especially true if your child plays sports. This ties into what we mentioned in #2. Because there jaw is not coming together properly, simple things like chewing can become difficult and uncomfortable. Because the teeth are harder to clean, bacteria and lingering food stay on them longer, and this can drastically affect how their breath smells, even if they brush consistently. If your child’s baby teeth are crooked, it’s very likely their permanent teeth will be as well. The baby teeth often help create the path for their adult teeth to erupt, so if it is obstructed with crooked teeth, this can lead to many more problems as they grow and develop. Children are judged by their smiles all the time, and having a crooked one can seriously impact their confidence. This can lead them to smile less and be less social, which can affect their overall happiness at school and at home. In fact, many scientific studies have shown that low self-esteem can also negatively affect a person’s physical health. What Can I Do About Their Crooked Teeth? Make sure your child is extra diligent about brushing and flossing, checking to see if they have cleaned all of the surfaces on every tooth. You should also limit their intake of excess sugar since it will always be more difficult for them to clean it off. For a more permanent solution, you should visit The Dental Center of Westport. Your children’s dentist in Westport can advise you on a variety of orthodontic treatments that can straighten your child’s teeth and help them avoid all of these issues entirely. 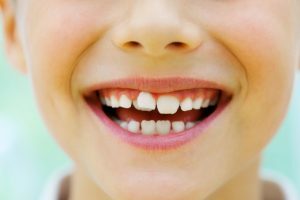 If you have any more questions about what you can do about your child’s crooked teeth, please give us a call today.